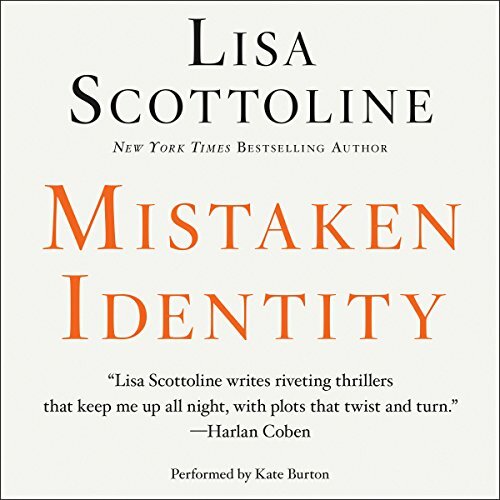 With the spellbinding crime fiction masterwork Mistaken Identity, Lisa Scottoline rocketed onto the New York Times best-seller list - and she's remained there ever since! A stunning tale of mystery and suspense, this classic from the beloved Edgar Award-winning author once again leads listeners down the gritty streets of Philadelphia and into the offices of the law firm of Rosato & Associates. When a new client who's been accused of murder - and who bears an astonishing resemblance to Bennie Rosato - asks the crusading criminal defense attorney to take her case, Bennie finds herself entangled in a sticky web of murder, corruption, and violence that threatens to reveal the shocking truth about her own past. If you haven't listened to Lisa Scottoline before, Mistaken Identity will prove to you what her many fans already know: Nobody does it better! Great story! Great ending as well and that's all I will say so as not to spoil it! Five stars all around! I was nervous after I'd purchased the book then saw the reviews not liking the ending but thankfully I don't agree with them. Another Lisa Scottoline great. A thriller to the end. Highly recommend this book along with all of her other masterpieces. This story had many twist .It keeps you gripped and wondering what might happen next. I so enjoyed listening to this book. I will be sure to check out more of her books in the future! Excellent story line. Didn’t anticipate the ending. One of her best books. Right amount of mystery and story. Right amount of mystery and story line. Loved Lou’s character in this book. Left me with a question about Howe twin. Wonder if the twin will ever appear /in future books. I keep thinking the stores can't get better, but they do. I plan to listen to all of Lisa Scottoline's books. Once again Lisa creates a mystery that slowly unfolds. I love that I don't know everything until the very end. Good Narrator, a bit slow. I may try more. the ending was disappointing. Another great book. I highly recommend. Great vacation book and you will not regret spending your time. 1st Scottoline I've listened to. I have Already downloaded another. Narrator was able to clearly distinguish characters with different accent or cadence. Good tension throughout and good character development.